Senior Melodie Snyder is the Student Coordinator for StandUp RMC and is working diligently during the month of October to raise awareness on campus about the dangers of drug and alcohol abuse. Snyder spoke about her personal experiences and how substance abuse impacted her life. Snyder explained that most of the drinking that occured in her house as a child wasn’t casual but, in fact, was for the sole purpose of getting drunk. As a result, Snyder grew up with the impression that drinking in excess was actually a good thing to do. This mindset culminated in the start of Snyder’s own drinking at the age of 15. Snyder went on to describe her experiences with marijuana use, and how coupling the drinking problems with marijuana led to many tragedies within her family. Snyder urges anyone who feels as if they may have a substance abuse problem, or people who are struggling with trauma from growing up in an environment where substance abuse was prevalent, to seek help. There are ways to be sober and still have fun on campus. 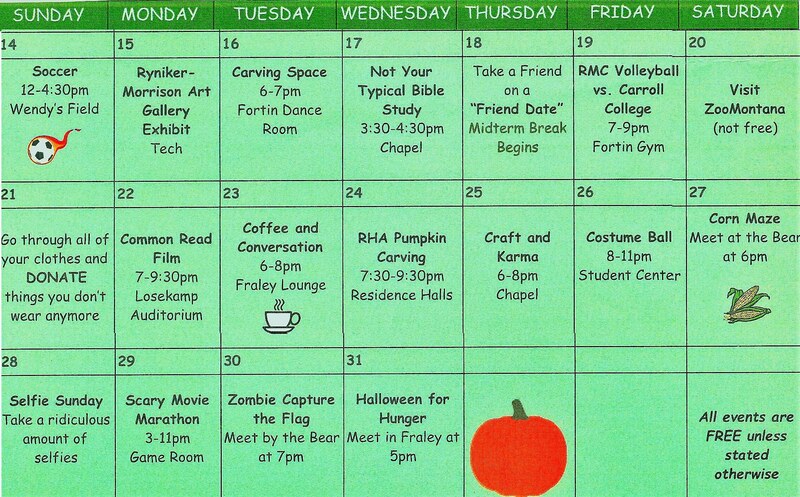 For more information, check out the StandUp RMC “Sober in October” calendar posted in the Student Center, their pamphlet “101 Ways to Get High without Doing Drugs” or the RMC Master Calendar at www.rocky.edu/calendar.